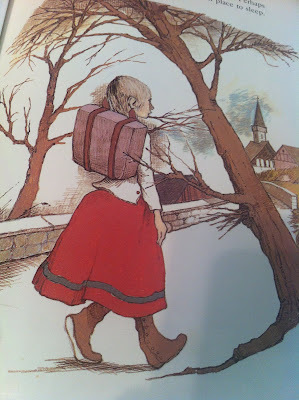 What do you remember most from your childhood storybooks – the words or the illustrations? I remember the pictures. When Atlanta Opera Director of Community Engagement, Emmalee Iden, approached me about directing this year’s Opera Studio Tour, I suggested the folk story, Stone Soup. At first, I did not recall much of the plot, but had a strong memory of one particular image – an orange and brown illustration from Marcia Brown’s Caldecott®-winning book , published in 1947, depicting a woman carrying a heap of carrots in her apron as she runs to a pot of soup. Brown’s version of Stone Soup starts off with three soldiers returning home from the wars. 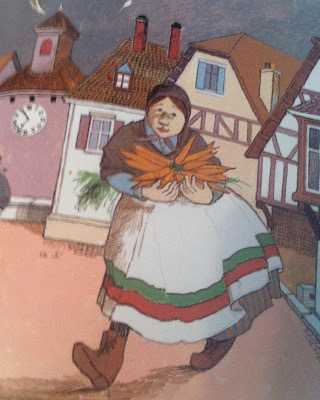 She does not give any historical context, but the soldiers’ uniforms seem to indicate that they are returning home from the Napoleonic Wars, (which coincides with the French and Hungarian accounts of the folk tale). The story clearly occurs during wartime. The town is poor, the people are rationing food, and strangers are approached with caution. Pretty bleak backdrop for a children’s book. . . but perfect for an opera, right? Stone Soup is a story that teaches its audience how to use your wit and ingenuity to feed yourself. In every version the town gets tricked into contributing ingredients for a soup that is being prepared. When the townspeople find out that the only ingredient is a hard rock, they each offer to help with the flavor by contributing something from their own pantries. By the end of the night the entire town is dancing, singing, laughing, and of course, eating! To get a better sense of the essential elements of the story I checked out every copy of Stone Soup that I could find at my local library, and compared the details. In one version of the folk tale a solitary soldier is traveling along a lonely path. In another, the wandering character is so cartoony that it didn’t really matter whether or not the town was wary of his arrival. In John Warren Stewig’s version, Grethel, a witty young girl, sets out to find ingredients for her mother. She uses a few clever tricks, (and perhaps her innocence) to get what she wants. John J. Muth uses beautiful watercolor paintings to illustrate the story in his beautiful 2003 re-telling. It is the biggest departure from what I knew, with three Buddhist monks seeking food and shelter, instead of soldiers. There were a couple of other peculiar details that stuck out in my research. In some versions the stock pot is supplied by the town, and in others the soldier carries it with him. Sometimes the traveler needs only one stone (or an inedible object like a nail or a button), and in other cases, the traveler requires many stones and asks for the help of the local children to gather them. At nightfall the traveler sometimes requests a place to stay, and in other versions there is no mention of the events that occur after the setting sun. I became curious about the order in which the ingredients are offered and amused that the carrots almost always seemed to come first. (As a side note, I am a terrible cook and recently learned a few tips from my wife when she was making soup for sick friend. Of course carrots would come first– they take the longest time to cook!) 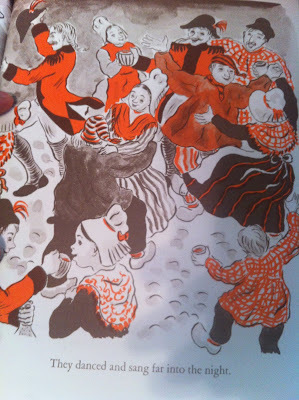 I even found this illustration, seemingly inspired by the picture that had spoken to me from Marcia Brown’s book. The version Emmalee Iden and I chose for this year’s Opera Studio Tour is an operatic fable told “in one delicious act,” composed by Daniel Dorff. The piece is a delightful concoction that incorporates many of the elements I found in other recounts. A solider comes to town looking for food, but learns that without money he is out of luck. Slowly but surely he wins over each of the townspeople. In the Atlanta Opera’s version, the audience will play a key role in helping to trick the constituents. By the end, even the Mayor becomes intoxicated by the delicious smell of the soup and the town gathers a meal. One important detail that I am particularly struck by is the fact that ALL of the versions end with a celebratory meal, complete with music and dance. As a theater artist who strives to bring people from many different backgrounds together, this is a valuable lesson. There is something about food and music that can break down barriers. Both elements have the capacity to put people at ease. 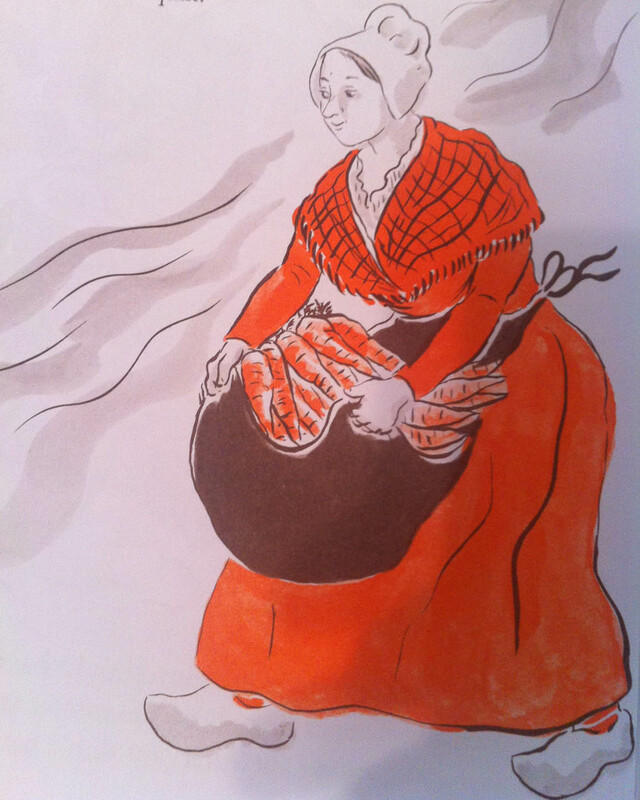 The tiny acts of generosity in the story of Stone Soup have cumulative effects. Who would have thought that a simple pot of soup and steady beat could result in strangers dancing together? This is a story that reminds us that strength, love, and hope can be found in every community – with the right ingredients. Please stay tuned for my next post. I’ll provide some insight in to how we are approaching the historical context, the design, and overall tone of the show. You can also follow me on Twitter at @parkcofield to catch updates from the rehearsal room. For more information on Stone Soup, a complete listing of community performances, and to purchase tickets, please go to atlantaopera.org. (1) Some Friends to Feed: The Story of Stone Soup (2005) by Pete Seeger and Paul Dubois Jacobs. Illustrations by Michael Hays. Copyrighted material. (2, 3) Stone Soup (1947) by Marcia Brown. Copyrighted material. 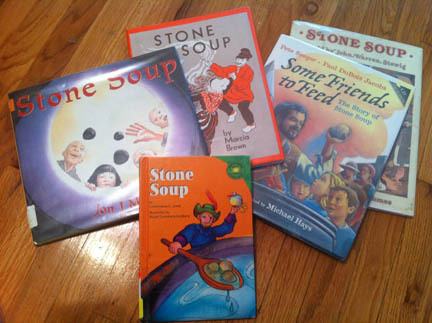 (4) Versions of Stone Soup checked out from the local public library. (5, 6) Stone Soup (1991) retold by John Warren Stewig. Illustrations by Margot Tomes. Copyrighted material. Park Cofield (Stage Director) is an Atlanta/ Los Angeles-based theater director and community builder. He creates vivid theatrical productions, original puppets shows, and collaborative spectacle events. His original work has been commissioned by the Théâtre du Rêve (The Red Balloon), Center for Puppetry Arts (XPT), and Art on the Atlanta BeltLine (SEE THE GYRASTACUS and THE OGRE’S ARM). In 2011, Park was awarded the Altvater Fellowship with Cornerstone Theater Company and relocated to Los Angeles to observe their community-based theater making methodology. With Cornerstone, Park has worked as a project coordinator on Creative Seeds: An Exploration on Hunger and Talk It Out: A Community Conversation to Fix School Discipline. Park’s opera credits include stage directing Rabbit Tales for The Atlanta Opera, assistant directing with Yuval Sharon on Crescent City, a new hyperopera produced by The Industry, and puppeteering in Basil Twist’s Hansel and Gretel and The Magic Flute in Atlanta. 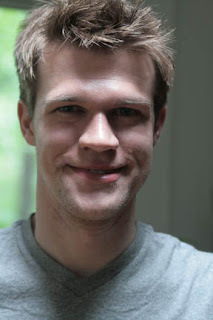 Park has degree in theater studies from Emerson College, is a member of TYA USA and the Dramatist Guild, and has traveled extensively in Europe where he studied and trained with Eugenio Barba and the Odin Teatret. For more information about his work, please visit: www.parkcofield.com.